When not issuing reviews and smackdowns, I occasionally get to turn my mind to other matters. Like interviewing Seymour Hersh, for instance, someone who gets to issue smackdowns of people with real power. Hersh can be found filling us in on human rights, the President, Iraq, Iran and other pressing concerns here. With Daniel Barenboim's final batch of concerts with the Chicago Symphony Orchestra as its music director coming up, the critics have kicked into overdrive with the "What does it mean?" articles. Wynne Delacoma had two this past weekend (here and here) and John von Rhein weighed in as well, but I can't find the link. 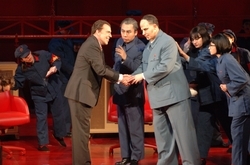 Drew McManus also has some thoughts on Chicago Opera Theater's Nixon in China, which will close this weekend, enlivened by the fact that he'd never been to the hall housing the former prez's show. Such concerns do matter in the way we end up hearing and enjoying, or not, a show. I just got back from a coffee shop, and the college kid in front of me in line took an unfolded paperclip, rubbed one end on an ice cube in the bowl holding containers of yogurt sitting on the counter, and then sniffed the paperclip. I'm not writing this to cue up more absurd Google hits, just to relate a true story. Also, the good people at Arts & Letters Daily have really dirty minds. How else to explain that their must-read Nota bene section includes two articles on breasts? This one, from Britain's Times, discusses the fad of breast-naming, while this one from the Washington Post discusses breasts and Google. Were they aiming for symmetry? Was I aiming for a left-right duality in that last sentence? Perhaps. All I know is that this is one post that isn't getting a picture attached to it, thus lifting and separating it from its predecessors. At the beginning of Nixon in China, Chinese peasants sing in flowery, ornate language of the power of the peasantry. After listing a series of rules for masters to follow ("Do not mistreat the captive foe/Respect women, it is their due"), they suddenly turn fierce, accompanied by a dramatic modulation. "The people are the heroes now/Behemoth pulls the peasant's plow," is their new refrain. In Chicago Opera Theater's production, which opened Wednesday at the Harris Theater, the peasants move closer and closer to the edge of the stage, defiantly shaking their fists. The crisp direction that lays that scene out, the clear diction of the chorus and the imaginative conducting of Alexander Platt that accompanies it are a perfect microcosm of the production as a whole. Even without the stars of the show, the forces involved show why the intelligent and plucky company willingly uses the word "opera" as an adjective and not a noun in its name. Now 20 years old, Nixon in China lives in a world in which roughly a generation and a half of the population has no memory of the Nixon years. What those of us in this group know of Richard Nixon we have gleaned from biographies, from Stephen Ambrose's to those by more muckraking authors, Oliver Stone's film Nixon, or TV documentaries. The picture that emerges from these sources is of a man haunted by his demons and made paranoid by the expectations he held for himself. But what these sources all have in common with each other, but not with Nixon in China, is that they all came after the Watergate scandal. Nixon in China focuses on the man prior to his downfall and disgrace, and thus gives us a man more average than he later appeared. Nixon's Nixon is a man who hadn't yet tumbled from power, a man more like everyone else. As this Nixon, Robert Orth has the stiff-legged gait and slight stoop down pat. 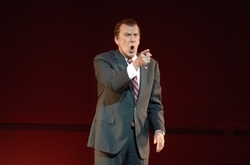 He sings with a robust baritone and admirably communicates Nixon's eagerness to please his Chinese hosts. When he sings on the tarmac just after his arrival that "News has a kind of mystery," he floats that last word and shows both the dreaminess and the hope that it contains. Maria Kanyova continues to make an impression with her clear soprano and impassioned acting. "This is prophetic," her big Act II aria, soared through the theater and almost every word was understandable, an achievement not met by Carolann Page on the Nonesuch recording. I heard Mark Duffin sing Peter Grimes in Bloomington a few years ago when IU needed to find a tenor who could handle the title role. His tenor in this role confirmed my thoughts that he still had the power to get out a big sound, but he seems more lyrical as Mao Tse-Tung than I remember his Grimes. Mao's lofty philosophical pronouncements unfold in long waves, which Duffin let roll out. Nixon's still the one, if we take "the one" to mean a bold look at American morals, and what happens when people make history. Alexander Platt's conducting allows all of this to be seen and heard. Nixon in Chicago received its belated Chicago premiere from Chicago Opera Theater at the Harris Theater last night. Robert Orth looks and moves like Nixon himself, and sings with an outsized glee that can only be called "American." Maria Kanyova's Pat Nixon is sweetly naive, and she sings with wonderfully precise diction in the oft-high role. Kathleen Kim attacks Madame Mao's fearsome coloratura with the same intensity that Madame Mao waged the Cultural Revolution. The dancers in Act II are superb. And Alexander Platt leads one of the tightest performances from an opera orchestra of some of the most complex writing I've heard, certainly one of the finest that's been heard in Chicago. I'll have a few more reflections later today or tomorrow, perhaps, as Thursdays are the dedicated Crazy Days at the magazine. Lyric Opera announced today (the Tribune and Sun-Times write-ups you just passed) that it had a $140,000 surplus. Preliminary rumblings of rumors would lead me to believe that the productions of Die Fledermaus, Gounod's Romeo et Juliette and Il Trovatore will be postponed to sink that surplus into Henze's The Bassarids, Robert Ashley's Perfect Lives, re-fitted for the stage from TV, and Ligeti's Le Grande Macabre. Oh, wait, that's not true. They are running a surplus, though. One of the joys in doing what I do is hearing music that that makes me wonder how a composer could have conceived of it. What made them conclude that an electric guitar could solo over a group one step removed from a Pierrot ensemble? How did they think that, of course, the flutist and the guitarist could talk back to the soprano they're accompanying? Performers who make old music sound new are another source of contentment, because they show that the past still has something to say to us. The secrets haven't all been given out, and this person has taken the time to decipher and then share them. I've been thinking about all of this after the last few days' worth of concerts. On Friday night, ICE played its final concert of the season in their residency at Columbia College. After a week of reading students' pieces and saying, "You know, you really shouldn't have the clarinet crossing the break every other eighth note," they convened in the little concert hall to play music by former students. They began with Dai Fujikura's abandoned time, for electric guitar and ensemble. Guitarist Dan Lippel rocked out with the almost-Clapton licks Fujikura supplied, while the ensemble played other licks. Licks by way of Boulez and Ligeti, with choppy phrases in halting rhythmic unison. Abandoned time begins with an ear-splitting chord with the winds, strings and piano all attacking in their high registers, and that little bit of attention-grabbing would be repeated later in the evening. Works by Earle Brown, Webern, and Saariaho came before the evening's big piece, Magnus Lindberg's Linea d'ombra. Soprano Tony Arnold was back for a little bit more, having sang at another downtown concert a few days earlier. Webern's Op. 18 songs sound a world removed to the poetic sentiments they contain: two lovers cementing their relationship, a conversation between Mary and Christ, and the Latin Ave Regina Coelorum. The relationship between text and music seems to have splintered, with the vocal line appearing not to emphasize any one phrase over the other. That said, Arnold gave a riveting performance and made the angular lines sound as non-angular as could be. Clarinetist Josh Rubin and guitarist Lippel bobbed and weaved around her. Lindberg's full-throttle Linea came last, and opened with the same primal scream as did Fujikura. Flutist and Executive Director Claire Chase had a long solo somewhere along the line (my notes, alas, were left in my other pants) and there was a lot of chattering amongst themselves, the whole thing whipping along at a fantastic speed. Maurizio Pollini arrived Sunday afternoon for a Mother's Day recital of Chopin and Liszt. (He'd originally planned to play the Boulez Second Sonata, but changed his mind.) Chopin is no dreamy neurasthenic in his hands, but one whose music has a majesty of expression that cannot be denied. The Op. 48 Nocturnes could have been mini-operas as their tragedies unfolded and the Op. 44 f sharp minor Polonaise was carried off with fury. Chopin may have died young, Pollini seemed to say, but he went down fighting. The Liszt selections afterwards continued this rediscovery after intermission. The barnstorming Liszt that Lang Lang brought a few weeks ago was displaced by that forward-looking, death-haunted composer Liszt became. Nuages gris, Unstern, La lugubre gondola 1, and RW—Venezia were played as one continuous set without applause, followed by the B minor sonata. Critics often write of a performer or composer giving a good sense of a work's form, and I'm always bothered that they don't explain what they mean. Pollini held this beast of 25 minutes together, so here's my attempt to explain how he did it, without recourse to theory. Each section of this work felt like its own unit, without ever seeming to be out of place. As its own unit, every phrase was sculpted to lead on to the next, and then into the next section. Through phrasing and dynamics and paying attention to each section's tempo, the sonata sounded like a complete piece and not a collection of fragments. By the time he got to the fugue near the end, it didn't sound like Liszt was throwing in a fugue for the fugue's sake, but because that was the natural outgrowth of each section that had come before. Having run the themes through a handful of permutations, why not turn to that ultimate contrapuntal exercise of a fugue? Adolphe is stringing everything on a theme of painting and music and the relationship between visual art and music. (I'm not even going to touch that conceit right now. It's too big and I've got other things pressing.) For his first concert, Adolphe picked two of his own works, one by Stephen Hartke, one by Oliver Knussen, and Stravinsky's Fanfare for a New Theater. Knussen's Songs without Voices, for eight players, takes three poems as a starting point, but leaves out the singer to sing them. The final Adagio features an elegiac English horn solo that was taken lovingly by Jelena Dirks. The other three movements swirl with movement and say what they need to in a very short period of time. Then there were the empty Hartke and Adolphe works. Hartke's Horse with the Lavender Eye, for clariniet, violin, and piano, is a Stravinsky L'histoire redux, especially the second movement, when Larry Combs (of the CSO) is leaping around on an E flat clarinet. Stravinsky said it before, and he said it better. Adolphe's What Dreams May Come? purports to chronicle that half-dream state just before he falls asleep. With a motoric bit of perpetual motion from percussionist Michael Kozakis establishing the frame, it certainly could lull someone to sleep. And when Adolphe tries to get a little haunting and creepy, it sounds like music from a TV cartoon. A bad, late-90s TV cartoon. It was more of the same after intermission with Adolphe's The Tiger's Ear: Listening to Abstract Expressionist Paintings. The long-breathed English horn and flute melodies (Jelena Dirks and Jennifer Hackett) were played well over the (again! Honestly, what the hell?) perpetual motion repetitive motion machine of the piano. The other five movements I'm willing to forget. What the Adolphe and Hartke works accomplished, I'm sure accidentally, was just how inventive Knussen's work is. His time doesn't move in steady, predictable patterns. His scoring utilizes the full range of the instruments. He doesn't let the audience down by giving them an ear massage and calling it new music. Choosing music like this which says nothing while saying it dully implies, to me, that it's just what CCM wants to be: safe. The group is filled with CSO players and their subscribers include a number of people I see at CSO concerts. What an opportunity to introduce them to composers they wouldn't hear otherwise! They could be taking risks, but instead they settle on this equivalent to upscale fast-food. You might be paying $6 for that panini, but in the end, it's still just a glorified hamburger. After my last post, I realized that I'd only written about a quarter of the music heard at the Green Mill last Sunday. There was a lot more than just Dai Fujikura's works that merit attention and repeated listening, so here goes. Experimental vocalist Carol Genetti contributed two works to the afternoon, 6tet and an untitled work for voice and electronics. I'd meant to catch a show of Genetti's at Links Hall a few months ago, but that didn't happen. Working with a range of glottal effects and sounds that suggest other phenomena (a squeaky hinge? ), Genetti's a sort of slower, more meditative and less exuberant relation to Meredith Monk. Her sounds evolve slowly and melt into each other, they don't smack your eardrums into paying attention. 6tet matched Genetti with three people manning electronics along with a bassist and bassoonist. Genetti's croaking ran up against moaning from bassoonist Katherine Young and scratching from bassist Jason Roebke. Joseph Mills worked the oscillators and various things that make noise. I made the jaded critic's mistake of assuming that there was no way this show was going to start on time, since none had previously, so I came in what turned out to be the middle of 6tet. Whether there was some dramatic arch I thus missed, I'm not sure, but there was something cathartic about the minimal activity. Genetti's untitled work brought in Eric Leonardson on electronics to manipulate her voice for about ten minutes. Again, Genetti does almost nothing, making little gestures mean a lot. No words, words carry too much obvious meaning and denote too much. Leonardson also bowed a cardboard box, if my memory isn't completely failing me. DePaul's George Flynn usually has a hand in organizing these matinees, so naturally he played his A Suggestion of Northern Lights, for piano. Originally written for Frederik Ullen, Flynn said he'd meant for the work to be called Northern Lights, but had a couple other projects pressing, so he couldn't finish it. So he improvised around the fragments he had composed and settled for a suggestion. It began with a falling, almost-Second Viennese single-note melody that grew into a more polyphonic frame. ICE had more to do than play a bunch of Fujikura, they also had to do Joshua Fried's Headset Sextet. Six performers, wearing headsets, stand in a line in front of six microphones. A burst of throbbing music comes out of the loudspeakers, than the speakers enter. (Fried's analysis is here.) The speakers babble at each other, against each other, with each other, occasionally blurting out the same syllables in unison. The intensity keeps ramping up as you try to follow who's doing what, which is part fun, part enervating, but ultimately exhilarating as your head keeps on spinning. Tony Arnold's mike wasn't working, so it was more of a Headset Quintet, alas. After all these divergent styles had had their moment, it was time for the style known as "fun" that's the specialty of Environmental Encroachment. Five members showed up to march through the club with their version of a New Orleans second line. Two drummers, two trombones and tubist dressed as a superhero/professional wrestler in Chucks gave everyone a ten final minutes of bonhomie to head out into the late afternoon glow. A glance to last week's calendar in an effort to get caught up to speed, and to catch you up to speed. 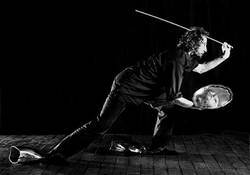 Last Tuesday, Matthias Kaul stopped by the Renaissance Society for some spirited stickwork. The percussionist has recorded much of Alvin Lucier's, John Cage's and Mauricio Kagel's music, among much else, but this was a showcase for his own improvisation-based works. His Walk don't Run consisted of just a snare drum and turntable with a worn-out record spinning silently. As the grainy sounds emerged from the speaker, so too did various patterns. A fleeting glimpse of a swing trap set? Yeah. A straightforward pattern of eighths? Kind of. Around this sonic near-static, Kaul played various rolls and stretched the drum-head to new frequencies. A little shy of ten minutes, its quizzical nature never got dull or remotely close to politely spelling out its intentions. Kaul's Doubleroom featured Gene Coleman's witty bass clarinet and an integrated loudspeaker magnifying everything he did out into this (almost comically) resonant space. Coleman's humming, reed- and key-tapping created a sonic web that wrapped around everyone's head. Coleman was joined by flutist Claire Chase, Kaul and bassist Jesse Ronneau for Arabesken, whose little volleys and solo shards added up to...volleys and shards. Thursday was the Chicago Symphony playing Mahler 4 without a conductor. But before they got to that, there was H.K. Gruber's Aerial featuring trumpeter Hakan Hardenberger. At 25 minutes, Hardenberger has the horn on his face the entire time for the wicked leaps and furtive jumps Gruber puts him through. Beginning with an otherworldly setting of soft string chords, Hardenberger began with multiphonics, by playing and singing simultaneously. It sounded like a painful groan, but it also sounded like nothing else I can think of coming from a trumpet. A little bit of playing with various slides removed, a little bit of blowing on a horn carved from a cow's horn, some piccolo trumpet thrown in just to keep things interesting, and you've got the Gruber. Then came the curiously static Mahler 4. David Zinman conducted, but the orchestra sounded like they were on autopilot and just went through the motions. No one seemed very pleased with having Zinman there to lead them, and he didn't give them anything worth responding to, apparently. No big climaxes, no drama enlivening that long third movement, not very much at all. Isabel Bayrakdarian sang the last movement with nice attention to the different moods of the child and altered her tone ever-so-slightly, and childishly. But Zinman did nothing to shape the piece. Sunday afternoon, ICE was playing at the Green Mill as part of the occasional new-music matinees held there, hosted by DePaul's George Flynn. ICE, or portions of it, played three works by Dai Fujikura. Clarinetist Joshua Rubin went through the glib, short phrases of Rubi(co)n, which was written for him; cellist Katinka Kleijn slammed and banged her way through Eternal Escape and violinist David Bowlin and pianist/composer Sebastian Huydts had a good time with Breathless, for pizzicato violin and toy piano. (Prior to starting, Huydts gave Bowlin an A to tune to.) All three of these works, brief as they are, are the work of a composer who's taken the time to figure out how to put a nice shape into a little bit of time. "Toughly argued," as Alex Ross might say. Monday night had me hearing Kleijn again in Eternal Escape, but this time in Orchestra Hall for MusicNOW. To my ears, and I was in the distinct minority with this opinion, mind you, but I am the one with the blog, she seemed to tear into it more in the jazz club. All the fingerboard-slapping Fujikura wrote sounded more violent and surprising to me Sunday afternoon than it did in the concert hall. Maybe it was where I was sitting. Shulamit Ran's 15-minute Fault Line was the main event and premiere. Near the beginning, there's a skein of music that echoes the Shrovetide Fair bit of Petroushka and sounds like Petroushka is cutting capers in the Casbah as the woodwinds flit through the percussive string and piano chords. She relaxes eventually into a series of solos that pass from piano to cello to violin. Mostly major, the melody's few chromatic inflections lend it that Middle Eastern flavor that runs through so many her works. Ran has prepared two versions of the work, one that includes a soprano at the end and one that trades her part between other instruments in the ensemble. I found the effect fairly haunting when Tony Arnold sang it, as the stringency of the wordless text was matched by her voice. John von Rhein had a slightly less positive reaction to the use of the soprano. He has a point. But if Ran wanted to end on an unsettling note instead of the fairly positive tone she'd established from the beginning, she succeeded. The piece was played twice, separated by a conversation/demonstration with Augusta Read Thomas, conductor Cliff Colnot and Ran herself. They didn't shy away from getting nice and detailed about the work's motivic relations, which is admirable, but perhaps a little less didacticism would've been welcome. Instead of trying to remove all the mystery of a piece, maybe just say, "We think these are the big moments," and leave it at that. But then, I'd probably be upset that they weren't discussing the work in enough detail. Ran got a good line in (off?) when Colnot asked her about a passage filled with major triads. She said that composers had wanted to "emancipate the dissonance" in the early 20th century, and now, wearily "The dissonance has really been emancipated!" So she tries to find new ways to use consonance. Joan Tower's string quartet In Memory came first. The firmly tonal, rhythmically straightforward work honored a deceased friend and was finished around 9/11. But the effect is the traditional Questioning-Anger-Resolution scheme, and left me cold. Maybe it was where I was sitting. I've been to a billion concerts lately, it feels like, but I think the actual number is something closer to eight in the last ten days or something. I'll have to consult my calendar, which is almost indecipherable because of the last-minute crossings-out of concerts to attend something different. So there will be reports on Matthias Kaul, ICE, the Chicago Symphony playing Mahler 4 without a conductor, a newish trumpet concerto by H.K. Gruber, the latest Shulamit Ran premiere, and much, much more.